NYC, 04/13/2019, 6:00PM. Writing Yellow: An Investigation into Self-Portraiture. 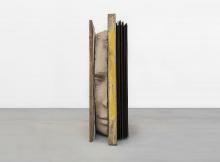 Mark Manders presents a variety of sculptural works that continue his “self portrait as a building”– an ongoing investigation into self-portraiture, architecture, language, and perception. Throughout his influential practice, Manders has written a continuous sculptural autobiography through objects and architecture. Over the past three decades the artist has developed a cohesive body of work that exists in its own realm, independent of a clear narrative or chronology.